Have you dreamed of a vacation in a romantic setting that includes trail riding on beautiful horses, but you’re a little short on time or cash? Cross Country International Equestrian Vacations may have a trip just for you. They are now offering mini-getaways in destinations such as England, Ireland and Italy that allow you to enjoy a little extra time in the saddle. Because the stays are only a few days and nights, the prices are considerably less than longer sojourns. 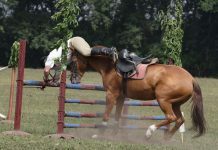 For more information, visit www.equestrianvacations.com and click on the link to mini trails. Bon voyage! Previous articleToo Hot to Trot?